I'm going to be right up front, there are probably going to be spoilers in this review, because I'm fairly sure I can't say a thing about this book without giving something away. Just an FYI. In a couple of weeks, Leah Clifford will be hosting her InsaniTEA Party at my local bookstore for the release of the second book in her A Touch Mortal series, A Touch Morbid, so I thought I should probably get around to reading the first book. I picked up A Touch Mortal last year when Leah was at Schuler Books promoting the book. I had had every intention of reading it then, but for those following along, a lot happened between then and now, and I didn't, plain and simple. So I picked it up the other night and pretty much read it in two sittings. It's a fairly quick read, which honestly surprised me. It was also easy to get into. I find that I have a hard time getting into the flow of a story with some books, but Leah seemed to make hers relatively easy, and I found myself reading along, enjoying where the story was going, even when it was becoming apparent what was going to be happening to out heroine, Eden. I feel like I should be up front with about what happens, because if someone is reading this who might have a problem with the subject, maybe this will give them fair warning. Eden commits suicide. She does this fairly early on in the book, after she met the love of her life, Az, an almost Fallen angel. Az is afraid that the Fallen are going to find out about Eden, and torture her to try to get Az to complete his Fall, so he plays a hand in her committing suicide, to protect her. This is where some will need to have a little suspension of disbelief, because that doesn't really sound like a win/win situation for Eden, does it? Anyway, I was going with the flow of the story up to the point. Eden becomes a Sider. She is more or less alive again, but her entire mortal existence has been erased from the memories of everyone she knew. She'll live forever; and she now has Touch. What is Touch, exactly? I have no idea. I don't know if the characters know what it is. I don't even know if Leah Clifford knows what it is. 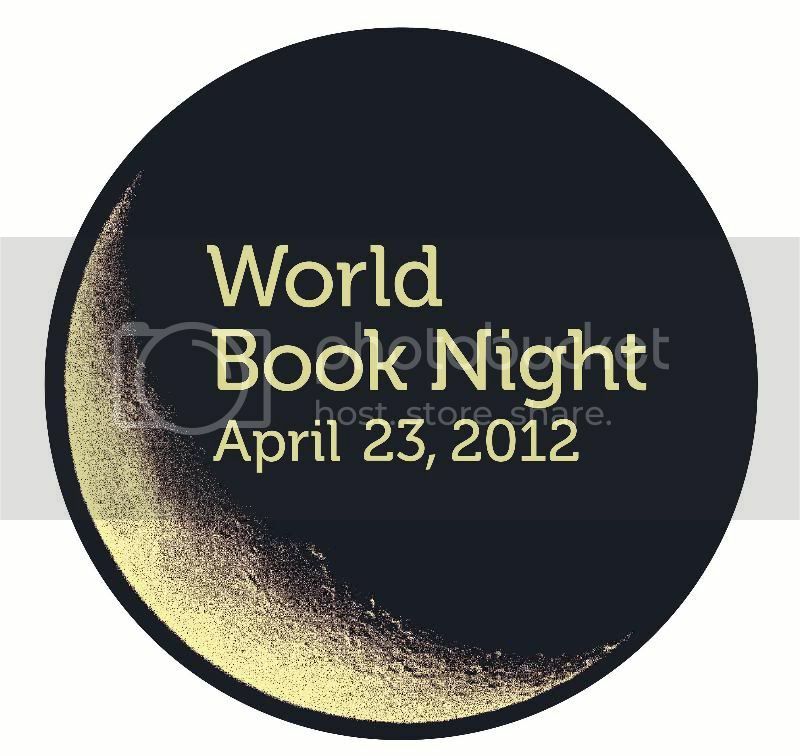 This is where I started to dislike the book. A lot. This key element, Touch, is never really explained, unless I missed a big chuck of the story. Eden is told she has Touch, needs to pass off Touch to mortals so that it doesn't build up in her system, and she just accepts it and carries on. No explanation. No questioning what it it. She just accepts it at face value, and the readers are forced to accept it at face value because there is never an explanation. By the time I realized how much I was frustrated by this one lacking key explanation to a key plot point, I was well over half way through the book, so I figured at this point, it was a quick read, so maybe Clifford explained it by the end. Just for those keeping track, she doesn't. However, at some point through the last 1/3 of the book, I discovered that I was really enjoying the story, was engaged with the characters, wanted to see how things were going to end with this book, questions about Touch be damned. I had already figured out some of the twists of the story and was fairly sure I knew why things were happening the way they were. 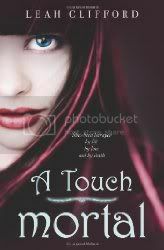 My reservations and questions about the purpose of Touch aside, I really ended up finding that I enjoyed A Touch Mortal. I'm just hoping that these questions are answered in the next book. 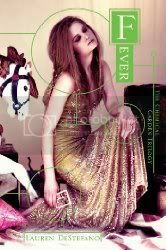 I was lucky to receive a copy of Lauren DeStefano's Fever late last year, and read it in two sittings. If you haven't read Wither yet, the first book in The Chemical Garden Trilogy, quit reading this right now, go out and pick it up, as there may be spoilers ahead in this review. I'm not going to lie, I wasn't sure what to make of Wither when I read it (check out my review here), but Fever totally sucked me in and wouldn't let me go. DeStefano wastes no time in throwing us into the story and never lets us go until, literally, the last word of the book. Rhine and Gabriel have successfully escaped the mansion and Vaughn, but is their newly won freedom worth the trials to come? It's really hard to write about Fever without giving anything away, but like Wither, I feel there is a lot of nothing going on here, but the difference is there seems to be a purpose to the nothing happening. Don't get me wrong; unlike Wither, where most of the action takes place in and around the mansion for the most part, Fever sends us on a non-stop journey with Rhine and Gabriel in search of Rhine's home and her twin brother, Rowan. OK, so I guess it's not a whole lot of nothing - there's a whole of everything happening in this story, but it's mostly in character and overall story development. We learn so much about both Rhine and Gabriel through their journey, and more about what Vaughn is up to, and even more how little Linden is in the dark about his father. With Fever, DeStefano really builds on every aspect of Wither and takes the story that much further. In Wither, we get to see how the rich live and prosper in this society, and in Fever we really get to see how the other half lives. We got a taste of what it is like for the less-privileged in Wither, but this time around we are thrown full force into the the lives of those who are living on the outskirts of society, seeing how they get by day to day. It's a dark and gritty world that DeStefano has created, and one that feels very real and tangible. I feel like I'm doing the book a disservice with this review, but in all honesty, I couldn't put it down. It's hard for me to quantify what it is that I like so much about the book. I think when I received Wither, I was expecting to dislike it. I don't know why that it is, but I think I went into the book thinking it wasn't going to be for me, so was surprised when I did enjoy it. Quite clearly it has something to do with DeStefano's writing. She creates a beautiful sense of imagery with her writing, so that even though her characters are living in a terrible world, we also experience those moments that really shine for them. Pick it up; you won't be sorry. I'm anxiously awaiting book three and seeing how this story ends, even though I'm going to miss it and the characters that inhabit the world. 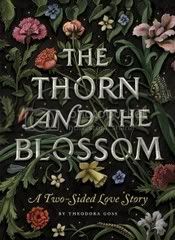 The Thorn and the Blossom is the story of Brendan and Evelyn, how they met, parted, met again and parted again. Doesn't sound like anything special, right? Well, you'd be wrong. The first thing that you will obviously notice with The Thorn and the Blossom is its unique design. It is printed in a "Unique Accordion-Fold Binding" (that's exactly how it reads on the cover). It book is slip-cased, and you can choose to read either Evelyn's or Brendan's story first, and when you finish with one story, you flip the book over and read the exact same story, only from the other person's point of view. The accordion printing gives it the illusion that the story is printed on one continuous sheet of paper, folded up. As for the story, it's your typical story of boy meets girl, boy kisses girl, girl runs off screaming into the woods, boy meets girl again 10 year later, girl again runs away screaming. What's all the running away and screaming about? Well, that part's the mystery of this little gem of a book. Normally, I wouldn't really be impressed at all with this story, as there's really nothing challenging about it in the slightest, but the book and the story itself are presented so cleverly, I totally overlooked that fact. Give it a try. It's cute, a little on the brain candy side, but you'll find yourself flipping the book back and forth, playing with the accordion layout. 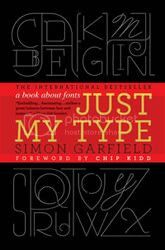 Being a graphic designer and a typographer first and foremost, I thoroughly enjoyed Just My Type. For a subject that I think most people would find fairly boring (exactly how much can you really say about type, right? ), I found the book to be fairly easy to read and I think most people who are not as familiar with type and design but are still interested in the history behind certain fonts and what went into creating certain typefaces will find this book very approachable. I love playing with type, seeing what can be done when you take words and turn them into strict letterforms and play with the art of the letters and still make something legible out of it. I really enjoyed reading the history and story behind the design of some of my favorite fonts. 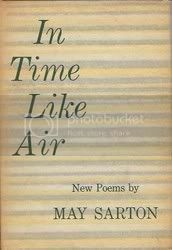 The one complaint I have with the book is several times Garfield mentions a certain font and what made that font something special for its time or mentions the way a particular letterform is designed, without always giving the reader an example of either the complete typeface or at the very least an example of the particular letterform he's talking about. I think this would have gone a very long way in helping people see what he is talking about. I don't think that it would have been too much to include a larger sized example of the letterform or a page that shows the entire set of glyphs for a particular font. With that one exception aside, I really enjoyed Just My Type and would recommend it to anyone who is interested by type and its history. That might slip, those cloudy dreams of threat. The unforgiven, unforgiving self for truth. These are the things we lie awake to ponder. As if each day a blessing did take place. A free self that might harbor faithful love. There is more in us than we have learned to give. These are the things we low awake to ponder.